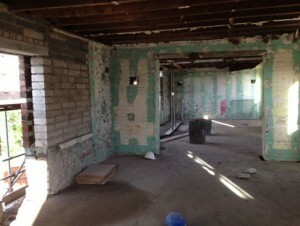 We are taking applications from potential tenants for a flat that will soon be available in our Batten’s Lane project. It is our mission to offer affordable housing for families in a cooperative environment. 1-bedroom, open-plan, ground floor studio flat. Energy efficient building, underfloor heating, self-contained with shared laundry space. Quiet, residential location, shared garden, private parking. £550 pcm (£7.58 above LHA 1 bed allowance), plus £21 service charge. Housing benefit accepted. 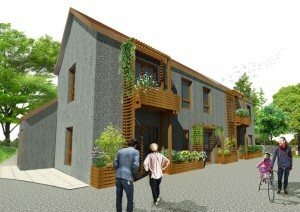 The successful applicant will be expected to take part in the housing cooperative. There are 6 flats in total and each tenant contributes to the cooperative. If you would like to apply, please contact us using the application form below and fill out the initial questionnaire and, if shortlisted, you will be invited for interview. The successful applicant will also be given a 6-month probation period. Request more information about becoming a resident. 2-bedroom, open-plan, ground floor flat (maximum occupancy: 3). £675 pcm, £21 service charge. Housing benefit accepted. If you would like to apply, please contact us using the contact form on this website. You will then receive an initial questionnaire and, if shortlisted, invited to interview. The successful applicant will also be given a 6-month probation period. This week (Weds 14th) we formally launched the first project at a small ceremony in St George. 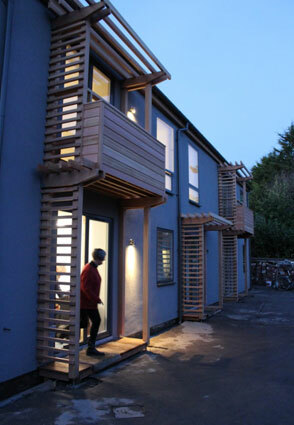 We now have six beautiful flats almost complete, and it was time to show them off to the media. 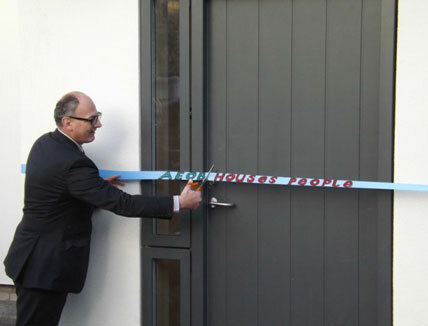 Councillor Paul Smith, Bristol’s cabinet member for housing, cut the ribbon to open the building for inspection. The council was not involved in this first project, but he looked forward to AEOB’s next development. “Next time, I hope I can say we did put something in”, he said. 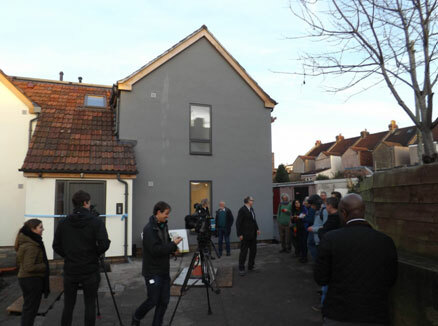 “AEOB is one of a wave of community housing initiatives that can help transform housing in Bristol. 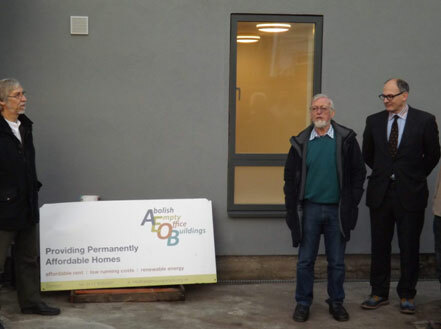 It was a great way to mark the culmination of three years work to convert unused commercial premises into social housing, backed by community investment. 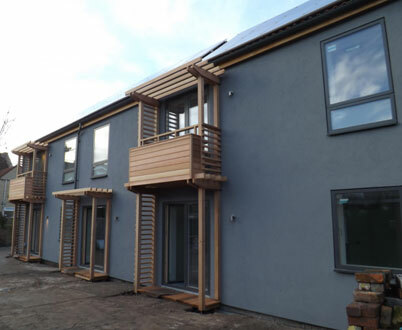 The flats are built to the highest standard, with triple glazing, solar panels supplying domestic energy, and underfloor heating. Chris Askew, of Askew Cavanna Architects, said “This is an amazing achievement, building affordable accommodation that is not mean”. That’s him below on the left, with Tony Crofts and Paul Smith on the right. and all our donors, helpers. And supporters. And so say all of us! Our building nears completion, so it’s time to give it a launch. We’ll be doing that next week – when there will be a ribbon cutting and some words at the site at Battens Lane and, we hope, photos and some press coverage to link with our latest fund drive (see previous post). That’s a small affair, because the site isn’t fit for a crowd. As some know, we were planning to follow it with an evening event to make it a larger celebration – at City Hall on the same day (Dec 14th). However, lots of people are already committed in the week before Christmas. And we’d very much like to have the chance to thank all our investors, donors, supporters, helpers, contractors and advisers – everyone who has helped us get this far. So, with apologies, we have decided it’s best to put the sparklier event off until the New Year. AEOB’s launch will now be in stages, NASA style. We will cut the ribbon and introduce the premises to special guests and media on Dec 14th, as already arranged. Then we shall have a proper, “thanks, and what next?” event at a date and venue to be advised. Thanks for your understanding, and we hope to see you in 2017. AEOB funding – one more stretch! As visitors to this site probably know, our project at Battens Lane is in its final stages. Less welcome news will be that it’s become clear, as we process all the last commissions, and contractors’ claims, that we have a cash shortfall – one we did not anticipate. It arises from multiple causes: some unexpected late costs, a hefty inflation rate in the construction industry, especially over the last 12 months, and some delays which mean that our occupation date, and hence income, has been put back a month, until January. Please be assured that none of this jeopardises the project (or the launch, which remains scheduled for December 14th). We had a very constructive meeting with Triodos bank last week. It is not the first time they have heard of a building project with time and cost overruns at the margin, and they are happy to work with us between now and the Christmas break to agree new cost projections, and some additional finance. Overall, the gap we need to cross is appreciable, but not unbridgeable – some tens of thousands of pounds. That is only a small fraction of the finance we have already raised. However, it will inevitably entail increasing our mortgage, hence our repayments, and reduce our scope to move expeditiously on to a new project in 2017. So key parts of our plan for the next weeks aim to reduce our demand on the bank, by combing through outstanding costs and reducing them whenever possible, and by raising any funds we can from other sources. Which is where you may come in. Our share offer remains open, and you’ll notice that the target on our ‘Home’ page has risen to £450,000. We’re asking all our investors, donors and supporters: would you, at this point, consider finding a little extra to help us take these last steps to completion? We know this is the time of year when other appeals will be coming your way, but it would be wonderful if you could consider this. Every little bit extra we can raise quickly now will help us come out of this first project in better shape, so that we can apply what we have learnt to do it again, and do it better. Our deep thanks in advance for any help you can offer. We think the building when complete will be splendid, and one everyone will be proud of. If you don’t have money to invest or donate, perhaps you will have a moment, in any case, to help spread the word about this short-term funding drive. PS, if you know anyone who might be inclined to make a donation, they may like to know that we are now registered for Gift Aid, so any contribution will be worth 25 per cent more. In the first week of October, the first AEOB tenants will learn that they have a place to move into at the end of the year at Battens Lane. This is good news, but the kind that comes with mixed feelings. It’s a landmark for our project, and we’re immensely pleased – and proud – that we’ve almost finished a building that is the first realisation of AEOB’s aims. This is when it gets real! At the same time, the application process – a task which, (like everything else…) we were managing for the first time – brought home how bad the problem of finding affordable homes has become in our city. Choosing who will benefit from the few places we can offer this time felt a weighty responsibility. We thought long and hard about how to rate the applications, and how to treat everyone fairly if they were called for interview. So we are very glad to have done the job; equally sad that we had to turn some people down. In the end, the interviews three of our board members conducted, together with evidence of acute housing need, were decisive. And the interviewers were unanimous about the six offers we have made, which have now been approved by the whole board. That leaves some need unmet – as was always going to happen. But seeing the applications makes it clearer than ever why our project is needed, and inspires us to continue our efforts. There will be other AEOB projects after this one, we hope, and we’ll be reviewing our process when everything is signed and sealed to make sure we record what we’ve learned and can make the selection process run as smoothly as possible next time. It will never be painless, but we shall continue to work to make it as clear to everyone, and as fair, as we can. Here (at last!) is the second issue of our newsletter. We update our website, facebook pages and twitter feed regularly. But not everyone spends their life on the internet. This occasional newsletter is for shareholders, and anyone else, who prefers to keep up to date this way – whether electronically or in print. Apologies that this one has been a while in the making, but we’ve been busy! The basic tasks for a conventional landlord or developer are simple. Get a working building up, then sell or rent it for as much as the market will bear. Our mission means we need to do more. As well as turning a derelict building into decent accommodation, we are creating a community. That generates lots of work that is less visible than the stuff that involves people in hard hats and safety boots. As we move into detailed planning for completion – due in just a few months now – and then occupation, both the visible work and the efforts behind the scenes are moving on apace. 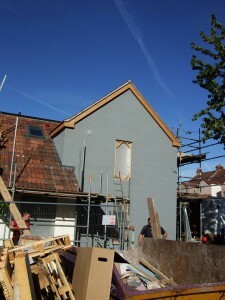 Visit the site, and you can see the progress on the conversion and extension at Battens lane. The old roof is completely gone, and the replacement complete. 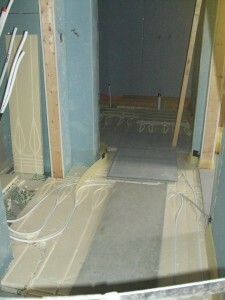 The damp course is done, old pebbledashing off and exterior insulation added. The interior partitioning is all in place, so the layout of the six apartments is now set. Electrical installation is nearly complete. Thoughts are turning to ordering fixtures and fittings, laundry equipment, kitchen units, bathrooms. Things, in short, are really coming together. Finishing a building like this is a complicated business. For this, our first project, the less visible work has also been quite complex. It’s all very well to decide in principle that we are going to admit people in housing need into new apartments, where they will have security of tenure, fair rents and a responsible landlord. That’s the whole point of the project. But making that happen in practice demanded laying down a myriad details that will regulate how it all works when real people are living in the flats, paying rent, and getting along with each other. So we are working hard now, on finalising all the documentation that we’ll need to make it clear how this is going to work. We need a clear framework for organising the relationship between the tenants, as it will be, and AEOB as the owner of the property. Mainly that means researching and writing our first tenants’ agreement, which involves study of the legal aspects of tenancies, how a socially responsible landlord ought to operate, and looking closely at how other organisations like Community Land Trusts and housing co-ops manage their affairs. We need clear wording to cover a host of day to day questions, providing for guidelines for how everything should go, and for what will happen when not everything goes quite right. We need to be able to handle use of shared facilities, repairs, rent arrears, complaints, anti-social behaviour, and to make workable policies for pets, parking, sub-letting, people who are away for long spells, dealing with marriages, deaths and break-ups, and many other things that a community will experience some time or another. Of course, there are templates out there, and plenty of advice. But we want to make sure all the fine print is a good fit for this project, and any that follow. It’s all a lot of work to get the details right – but worth it to move beyond the simple aim of providing places for people to live to the more complicated business of helping them live reasonably together, and ensuring they fulfil their financial obligations in a way that validates our business model so that we can do it all again. We are learning as we go, and hope to finalise all this shortly so that we can consult on the precise legalities and ensure our prospective tenants know exactly what they’re signing up for. And speaking of tenants, we have now got to the stage where we are reviewing applications from people who hope to move into Battens Lane. This is exciting – the real result of all our work. Also sobering: reviewing the applications from people in serious housing need reminds us whay we are doing this, and brings home the responsibility of choosing. Inevitably, some people will be turned away at this point, so we thought long and hard about our selection criteria, and how to handle interviews. We also have to comply with legal requirements for documention, and have some assurance that we will receive rents when they are due. But all being well, the offers to the first batch of tenants will be going out not long after you read this – a real landmark. We’re proud of our project, and we want to tell the world – both to lay the ground for future fund-raising and to help others do similar things in other cities. Hence a plan to produce an AEOB handbook – which we hope to have ready in time for a publicity effort when we “launch” Battens Lane as our first completed project. So far, we have an outline, and a plan to research what we need to fill it out, pulling together our existing documentation and interviewing all the people who’ve contributed to the project. How did we do it? What have we learnt? What help might you need to do something like it? Then there’ll be writing, design, production – probably as a printed booklet and a web offering – and distribution. Sounds like another project in itself, in fact… But it’s an important part of this stage of our work, to help spread the word and contribute to the broader conversation about housing in the UK. Our share offer remains open for now – with regular ads in the Big Issue continuing to attract investment. Although we have reached our initial target, the size of our eventual loan from Triodos for the building works will depend on how much we raise from the community, and the smaller the loan, the less interest to the bank has to be covered in our business plan, so for now the position is still: the more investors the better. Meanwhile, we lost our lovely treasurer a few months back, and are managing the finances and accounting as best we can until we find someone to take her place. We are keeping things on track by dint of Board members taking on lots of extra work, but if anyone reading this knows of a likely volunteer who can help with book-keeping or financial control, do point them our way, please. Housing policy in Bristol – moving ahead? Marvin Rees’s victory for Labour in Bristol’s mayoral election followed a campaign that saw housing emerge as a key issue. His newly appointed housing lead, Bristol West councillor Paul Smith set out his initial ideas for easing housing supply and tackling homelessness in a thoughtful piece for the Guardian in June. We haven’t seen the details yet, but he enlarged on this a little at a meeting of community housing organisations a few weeks later. The Council will no longer sell land, he declared, as it considers it holds it in trust for the community – as it has done for 1,000 years! It’ll be interesting to see what he has in mind for using community organisations to boost housing supply, and what this leads too. Specialist provision seems to indicate refurbs for people with some special need, but we are hoping it will be worth having a conversation about any broader use of this idea. There must be council properties that would lend themselves to the approach AEOB is already on the way to proving in principle at Battens Lane. We were delighted that Paul took up our invitation to visit the site, and that he was very enthusiastic. There may be other plans afoot next year, from Bristol Community Land Trust and the Schumacher; there is even talk of a Bristol Housing Bond to help finance social housing. AEOB will only be part of the big picture, but repurposing existing buildings must be a strategy that can be taken further. Dear reader, we are sorry that applications for potential residents of Battens Lane are closed. We have had a large number of requests and can accommodate only a few in the 6 units available. We will be opening a new list as we move into our next project. Please check this web site for future opportunities. A quick tour of construction of our community housing site in Bristol. ACORN have provided coverage of our venture.